An hour before our 9:30am Easter Service, I received some bad news from my Pastor of Tech Ministries: our plans to do a live video feed of our Cardboard Testimonies hit a huge roadblock; the video processing unit was not working. This was devastating news because it would mean that most of the people in the worship service would not be able to read the words written on the cardboard sheets held up by those giving their testimonies. For those of you who are not familiar with Cardboard Testimonies, it is a powerful tool where people write (in 2-6 words) their area of brokenness on one side of the cardboard sheet, and how Christ transformed/healed that brokenness on the other. This live video feed would enable everyone in the Worship Center to see clearly those powerful words of testimony to God’s greatness. My first inclination was to give up and just make do. There just wasn’t enough time or know how. But something inside of me told me to “press in.” So I went to one of our Techs and asked him if this problem was “impossible” or “improbable.” He told me that it wasn’t impossible, but it was highly unlikely to get it to work. He also told me that working on it might cause additional problems in the worship service. I prayed a quick prayer for guidance and sensed the Spirit again saying, “press in.” So I told him to work on it, and that I would take responsibility if something went wrong. Then I gathered my worship team and asked them to join me in prayer for this. And then we waited as we continued our other preparations for the service. It was the most powerful Easter service in recent memory. People, even newcomers and visitors, were weeping during the Cardboard Testimonies. After the presentation, the church gave God and the testifiers a standing ovation that lasted minutes. It is difficult to discern whether to “press in to Jesus” or to “let go and let God.” There’s no formula. There’s no cut and dried method. I think it’s more about relationship than technique. It’s about paying attention to the Spirit and about having ongoing conversations with God. It’s about walking with Jesus in daily, ordinary life that we learn how to respond when something “out of the ordinary” happens. 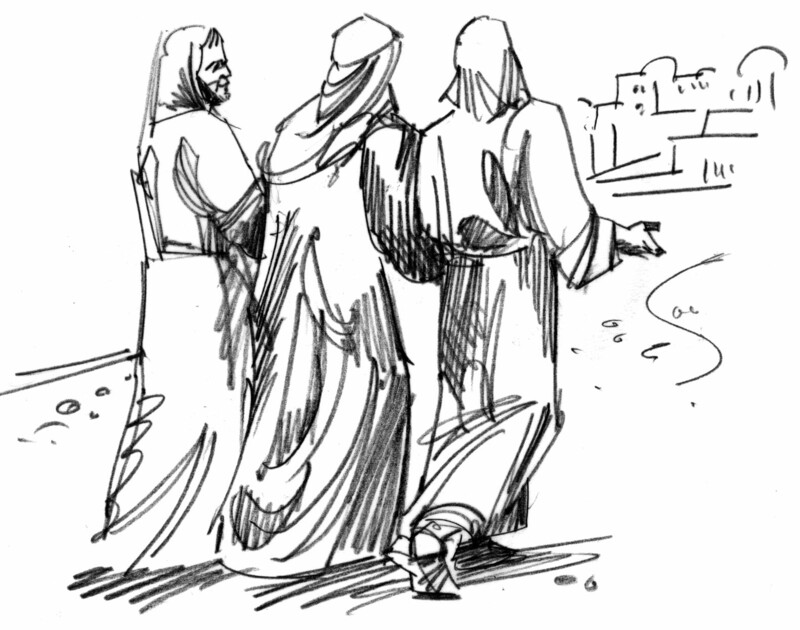 I just read this morning about the two disciples who walked to Emmaus on that first Easter morning (Luke 24). The Risen Jesus joined them, but they had no idea it was him or that he had risen from the dead. But when he was about to leave them, it says that the disciples “pressed him to join them” (v. 19, New Jerusalem Bible). Because they pressed in – pleading him to stay with them – their eyes were soon opened to see the glory of the Resurrected One. It still happens today. As I experienced, when Jesus causes us to press into him, he can open our eyes to see him so much greater than we thought or imagined. When was a time where you pressed into Jesus and then saw him do something remarkable? What are some qualities that differentiate between “pressing into Jesus” versus “demanding God to do something”? As you know, Doug, I don’t write on the blog, partially because I don’t know how, but partially because I believe it would keep me from really saying how I felt. This blog is especially poignant to me today. Tonight, or rather at 1:30 a.m. I leave for the Medical mission I have been going on for 5 years now, this time it will be Honduras instead of Nicaragua. There are times when I have felt the need of pressing in as opposed to talking to Jesus/God. This year is ‘feeling different’. I haven’t been able to put my finger on it, but I wll find out soon. I almost didn’t go, but HE let me know, that I need to go. I’d appreciate your prayers on our behalf. We have a team of 43, 1/2 medical people and 1/2 construction crew. Last year 30 people came to know the Lord! Thank you Doug. I’ll be praying for you and your team, Anita. May the presence, protection, and peace of Christ be with you. And may you bear much fruit for the Kingdom.